From time to time, I enjoy reading through the thoughts of St. John Vianney because they bring comfort and consolation when I am enduring daily trials. Although I firmly believe in Jesus Christ and His Catholic Church, it doesn’t go without saying that daily life is a grind…it’s hard. Nowhere in the Gospels does Jesus say that life is a bed of roses, actually, he tells us to pick up our cross and follow him. Even in the Resurrection; the Cross is present. So knowing that daily life is toil, what must we do to successfully make it through each day? In the life of the saints, particularly St. John Vianney, believed that if we sanctified our days, in other words, we made our days holy through prayer and sacrifice, we could endure the daily struggles of life and grow in holiness. With today being the feast day of St. John Vianney, here are 7 Quotes on the Sanctification of Daily Life from him. I would encourage you to read through these, truly take them to heart and always remember that Jesus Christ is in control, no matter how difficult life may seem. 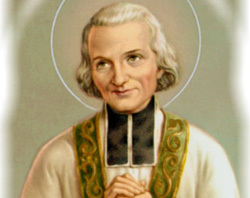 Let us pray: O, St. John Vianney, you endured daily struggles as the Priest of Ars, but through daily prayer and sanctification brought many souls to Jesus Christ. Intercede for us daily and assist us in sanctifying our day, so that we, through your guidance may bring those we encounter on a daily basis closer to Jesus Christ and His Catholic Church. Amen. Thank you for the great post. Saint John Mary Vianney is a great model for our times. May his prayers on our behalf bring glory to God and salvation to us! Thank you for this timely posting on twitter. What a blessing St Jean Vianneys life was. We can always learn from his wise words and life of service.